59 people have viewed this property this week. Thatch Hill is located on the north side of the island, just 300 yards east of the Rum Point Club. 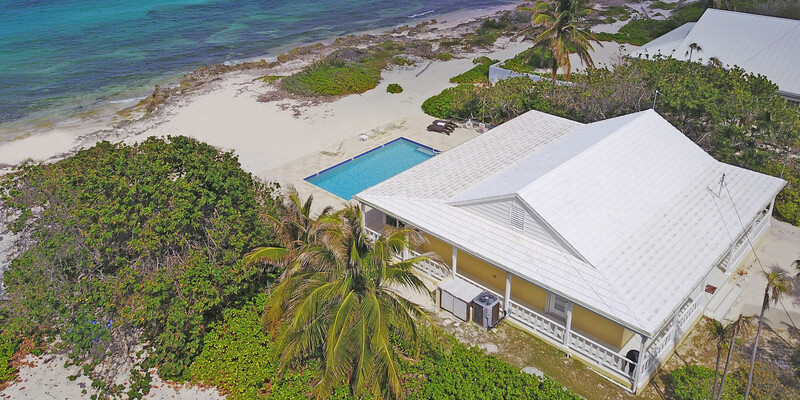 Thatch Hill boasts stunning views of the sparkling Caribbean Sea, a large beachfront freshwater pool, and a spacious full-width screened porch with outdoor dining table for sunset dinners and drinks. 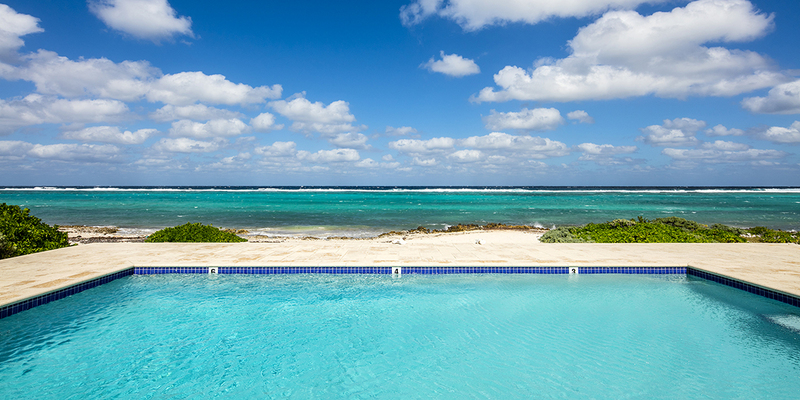 A protective reef provides excellent snorkeling just steps off the pool deck! 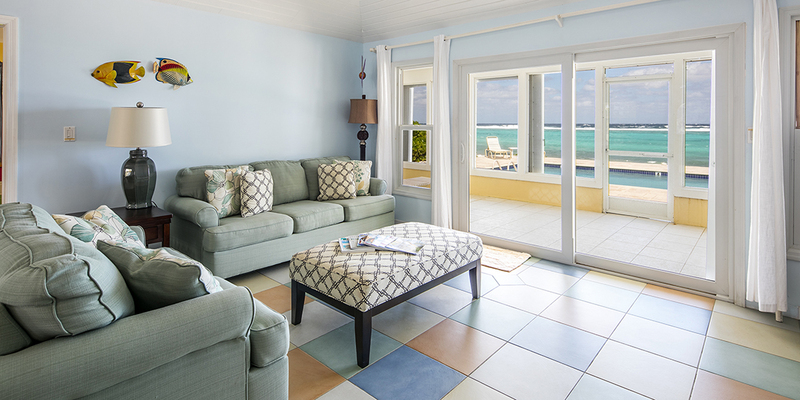 The interiors are are bright and sunny with a comfortable beach house vibe. An open-floor plan divides the house with a large vaulted great room in the center and bedroom suites on each side. The living area comes furnished with a comfortable sofa and love seat, large flat screen TV, and sliding glass doors onto a screened porch. 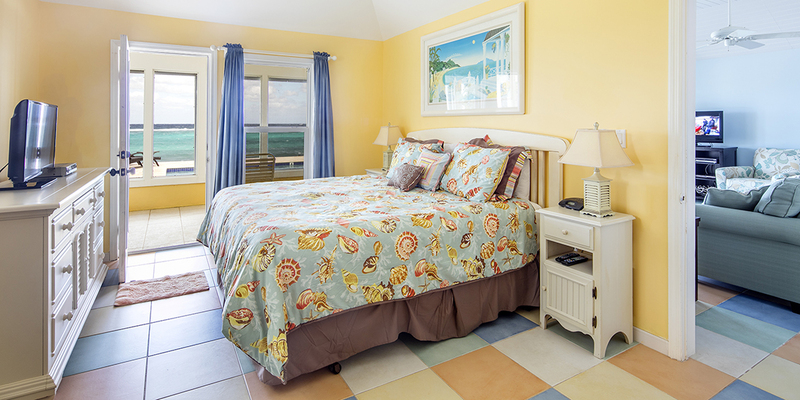 Both bedroom suites have ocean views, en-suite bathrooms, flat screen TVs, and access to the porch. 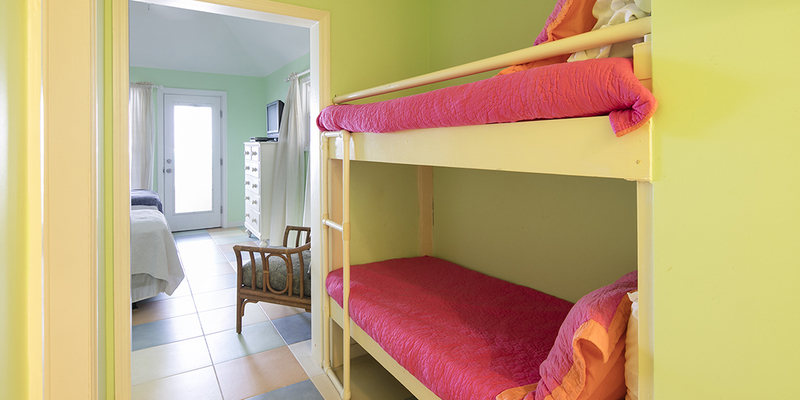 The master bedroom has a king-sized bed, while the guest bedroom has double twin beds with an attached bunk-bed area perfect for 4 children. A roll-away bed can be rented for a 5th person. 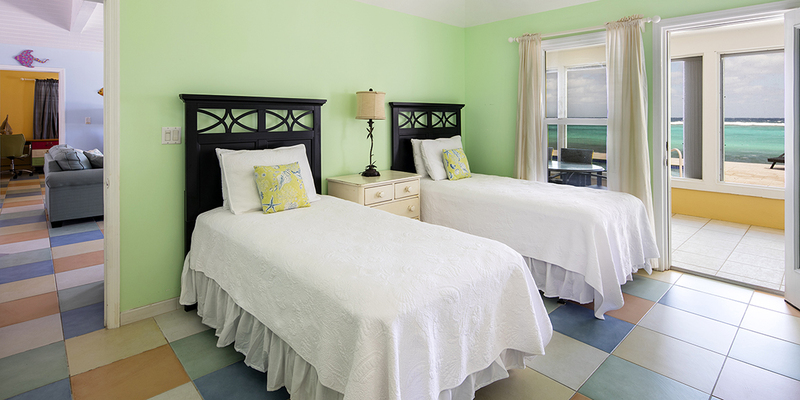 The two twin beds can be converted to a second king-sized bed upon request. A full modern kitchen comes equipped with standard appliances, a breakfast counter with bar seating, and dining table with seating for six. Dishware, glassware, cookware, cutlery, and charcoal grill are also provided. Lastly, the proximity to Rum Point is perfect! Close enough to be an easy walk to restaurants, bars and water sports, but far enough away for our guests to escape the crowds. 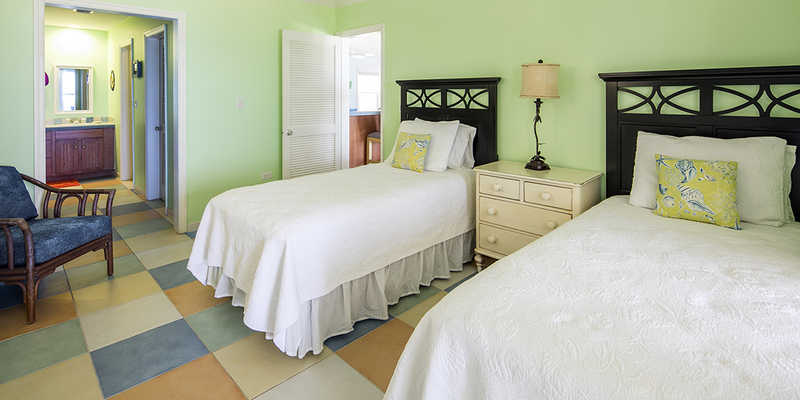 Discover for yourself why repeat guests love booking their Cayman vacation at Thatch Hill. *Note: Silver Thatch kayaks available for discounted rental. Signed waiver and 5 day minimum required with 6th and 7th day free: US$39 per day per kayak/SUP ($195 per week/each). Paddles included. The closer you get to Rum Point, usually the sandier the beach as well as swimming. Either way, with the abundant marine life we have in the water, you will want to wear foot protection—either pool shoes or fins. The prevailing trade winds from the east also make flying insects less of a nuisance—many of the homes in Rum Point don’t even need a screened porch. Lastly, there are 2 large resorts in the east end (Morritt's and The Reef) that offer manicured beaches plus restaurants, a grocery store, liquor store, gift shops, a Subway sandwich shop, and a cafe/pastry shop. These two resorts also offer scuba, snorkel trips, jet skis, windsurfing, kiteboarding, ocean front pools and bar service. Tortuga Divers and White Sand Water Sports offer snorkeling tours, paddle boards, jet skis, etc. Normally we (2 couples) spend New Years week in the Keys. We wanted to try a new destination especially with sand and surf. The place was perfect! I liked the separation of the two bedrooms with in-suite bathrooms by the common area and kitchen. View was wonderful and pool too. Beds and linens and towels very comfortable and nice. So quiet except for the lull of the waves. All in all we had a beautiful stay at Thatch Hill. 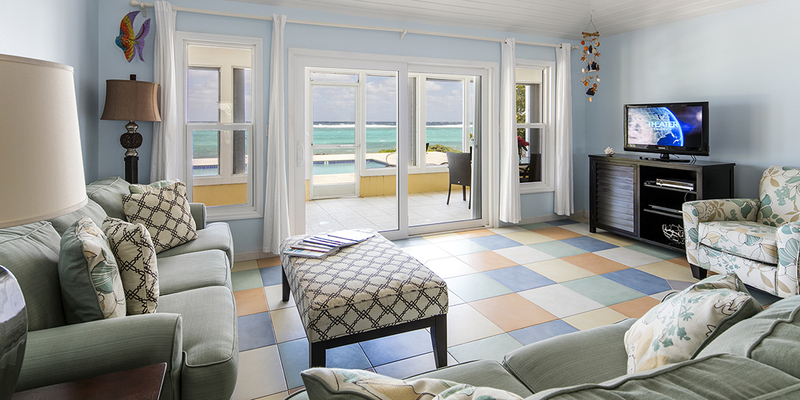 So glad we made the decision to rent Thatch Hill for our 5 day Cayman vacation! From what we could see, Thatch Hill has one of the nicest beaches on that part of the island. That along with the private pool provide a perfect outside experience. Snorkeling out from the house was very nice even with some of the wind we experienced. On the inside, Thatch Hill is one of the better equipped units we have rented. Everything was in great shape with new towels and linens a plus. We only met with the property manager briefly on the 3rd day when she finally caught us but other than that we didn\'t need any assistance. Pool guy came by one day and was a perfect gentleman. 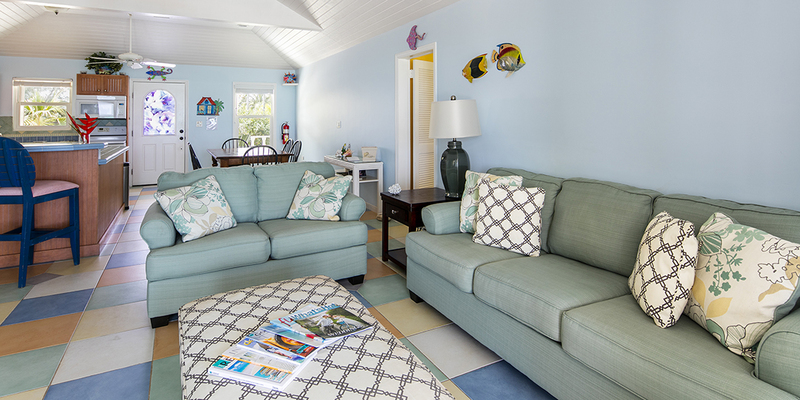 We would highly recommend Thatch Hill to any couple or couple with kids that would enjoy a beach cottage vacation. We are planning to return! Enjoyed our stay at Thatch Hill. Scott helped with my booking. Scott was great and the process was easy. Thatch Hill is a quaint house. The house was well maintained and had the essentials. We did not need the manager, however, she did stop by to introduce herself. Very nice touch. We very much enjoyed the people of the Caymans. They were warm and genuine. We have been to other Caribbean islands and this is not always the case. We are family of kiteboarders. While I realize we arrived at the tail end of windy season, this was spring break for our children. The wind did not cooperate. When not windy, we snorkel and we snorkeled much that week. There some great spots on the island and easy to access. Other than seven mile beach, the beaches of the north and east end are rocky and require booties. I didn’t see this fact in reviews before booking the trip. We stayed in the North end, closer to Kiteboarding spot. Therefore, probably would have not changed our location. Pictures of the Grand Cayman beaches are probably mostly taken on the west side of the island. Perhaps this may help another kiteboard family. If so, be prepared to drive a good distance to the east end. Lastly, the silver thatch discount card did not work for any of our excursions booked through white sands. Not sure it is worth $500.00 charge. I think that is what I was charged for silver thatch membership. Excuse me if I am wrong. So glad you had a memorable stay on Grand Cayman. Also sorry wind conditions had calmed down - impossible to predict Mother Nature. I was on island the last 2 weeks of April, first week awas windy with kite boarders everywhere, second week was flat. The beaches at Rum Point and The Wyndham/Morritts are barefoot beaches with barefoot swimming. Silver Thatch benefits include accidental damage protection (a $69-99 value), fitness center access, business center access, $100 charter discount to Stingray sandbar (Silver Thatch Charters), discounts to local vendors (White Sand is a preferred vendor - you should have received a 10% discount - wish you had contacrted me), free use of high quality Scubapro snorkel gear (rents for $40-50 per day per person), baby items, bluetooth speakers, Apple TV, discounts to everything at Rum Point Club and several other restaurants, and much more. You were charged $395.50 for the service fee. Please come back again and I will make sure you receive the full use of the Silver Thatch benefits. Spent a week at Thatch Hill over spring break in March with my wife, son, daughter-in-law and 1-year old grandchild. 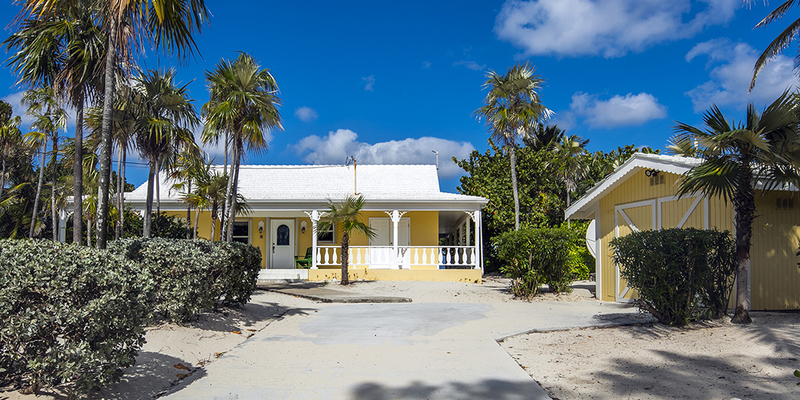 The house is perfect if you are looking for something relaxing and quiet away from all the hustle and bustle of the seven mile beach area. Everything we needed was available and in good working order at the house in terms of kitchen items, towels, laundry facilities and appliances. Nice privacy as there is an empty lot on one side of the home and thick vegetation between the adjacent home on the other side. Great pool area and we also enjoyed eating meals in the screened-in porch. Very good snorkeling in just off the beach where we say stingrays, green eel, various fish and coral life. Easy to get to the restaurants at Rum Point. We did not have any issues so did not need to contact the managment but were made aware of how to get in touch in needed. Excellent communication throughout the easy booking process and pre-arrival. Great memories and would look forward to a return visit. We stayed at the Villa at the beginning of March ! Everything was perfect ! The location is excellent ! You re near , by walking distance , Rum Point where You have very good restaurants ! You have your own beach and the snorkeling there is the best on the Island !! The pool is great and the house is just again perfect ! Everything You want is there and it s very quiet ! We really recommand this Villa !! We visited Grand Cayman for the second time - first was on a cruise. Our family absolutely loved the home, the pool, the location and the entire island. We always felt safe and thoroughly enjoyed our stay. The bedrooms were large and plenty of room for everyone. The kitchen was stocked with what we needed. We highly recommend Thatch Hill and will retury. Thatch Hill was great! Clean, all the necessities, quiet location, wonderful view, etc! Scott and Judy were extremely helpful with any and everything we needed before our travel as well as when we were there. The home has a great island feel and has everything in the kitchen that will make you feel at home. The pool was kept very clean and the kids had a blast. Our family (5 year old boy and 7 year old girl) always like to have a private home w/ a pool when we travel so we are never constrained with swimming and \"loud family fun times!\" And this was yet another vacation that did not disappoint! One thing to consider is that being this close to the ocean is that it was a tad windy but prevented us from getting too hot. Also, the beach at the bottom of the stairs (off the pool) is wonderful and has clean sand where the kids, and even adults, can play. The closer you get to the ocean is does get rocky. I even managed to cut my foot within the first 10 minutes we were there. Learned my lesson:) We still managed to get in the ocean and had a great time. It\'s a very short drive to Rum Point where there is some great things to do. If considering Thatch Hill for your family, we would highly recommend it. Definitely wonderful!!!! We already miss it! My wife and I have been fortunate to stay in many different rental homes in various locations. No matter how great the house, there always seems to be a few things that are disappointing.................not with Thatch Hill. First, the location and the view are spectacular! The swimming pool leads down to your private beach and into the ocean. Entry into the ocean is a little tricky, but doable. The snorkeling out front was the best we experienced all week. Inside, the beds were comfortable, water pressure was great, plenty of hot water for showers. The kitchen was very nice with everything you would need for preparing meals at home. The TV looked to be about 55\', Samsung High Definition with a great cable package included. Along with the TV you have a Bluetooth DVD player if you want to watch movies. The pool is very large with a nice surrounding pool deck with plenty of reclining lounge chairs. There is also a nice screened in porch with a table and a few chairs if you want to stay out of the sun. With thick vegetation on both sides of the house, privacy is never an issue. In conclusion, Thatch Hill was everything you could possible want in a comfortable beach house. For one or two couples, in this price range, it would be hard to find a better rental home. Thatch Hill was fantastic. My wife and I were there with our oldest daughter and her two kids. It is on the quiet North side close to Rum Point (short walk). What a great way to spend time. Having the screened porch was great in the morning. The deck was great in the afternoon with shade and almost always a nice breeze to keep it close to comfortable. The pool was wonderful. Nice to take a dip in the pool when it is hot. The house is set up nicely with great air conditioning. It is fully equipped with what you need to cook. The exterior area is well maintained and nicely raked. Did not have a bunch of debris in the yard like so many others have. The master bed was pretty comfortable. The twin beds are quite firm. However, the on-island manager purchased a foam topper so that they were comfortable. The snorkeling was pretty good right out the back door. We had to kind of go searching the area a little to find a lot of nice coral and fish. As soon as you find the coral, you find the fish. We rented snorkel gear, stand up paddle board and 2 person kayak. For our take on the close by eating establishments, the Wreck Bar at Rum Point is pretty good. The Restaurant there is good but pricey. The Kaibo Restaurant was awful. The outside tables were dirty and the food was not good with the exception of the pizza. The drinks were nothing special. For overall good eating, the Calypso Bar and Grill was fantastic. We chartered the boat that is available through Grand Cayman Villas to take us from Rum Point across the bay to the restaurant. Fantastic time. Also, we chartered the same boat for the stingray city, snorkel and starfish point. The boat is very nice and the Captain was fantastic. Highly recommend the boat charters. 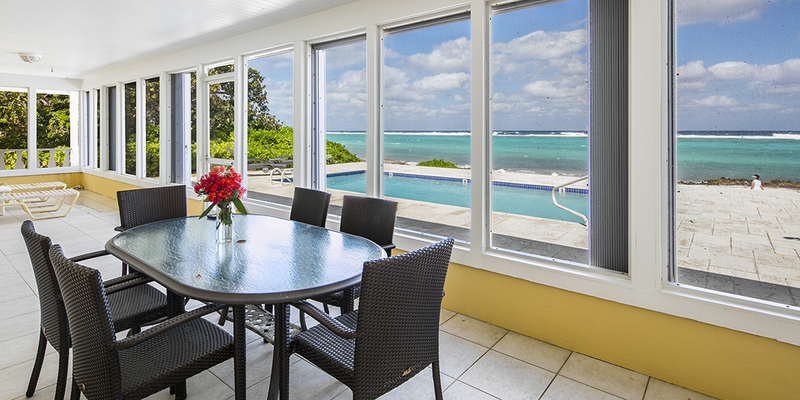 All in all, no doubt we would rent this house if we return to Grand Cayman. We loved Thatch Hill. 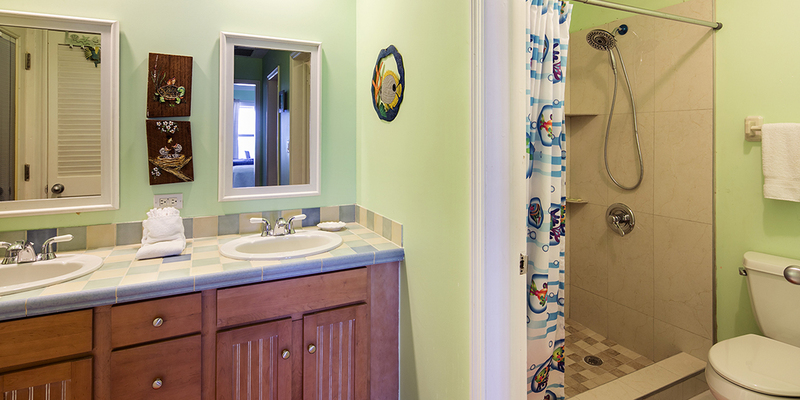 The location met all of our requirements – privacy, quiet and convenience. The house is a standalone house with a swimming pool, right on the ocean with a small sandy beach and walk in access to good snorkeling. 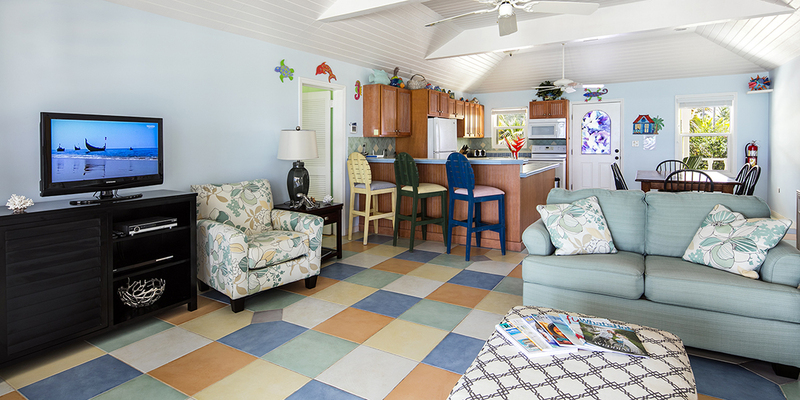 It\'s a charming 2 bedroom, 2 bath beach cottage with porches all around the house. The front and side porch is open (sunset views through the trees) and the large screened in porch in the back (dining for 6, lounge chairs for 2) faces the pool and beach. The pool deck had lounge chairs for 4 and the beach had 2 or 3 lounge chairs. There are several good restaurants nearby. Rum Point, with its 2 restaurants is within walking distance (less than a mile), Kaibo, with its 2 restaurants is a long walk or 5 minute drive away and several other good places to eat are within a 20 to 30 minute drive. We were two adult couples for the first week and then just DH and me for the second. The bedrooms, each with a full bath, were separated by the large kitchen/dining/living room. There was privacy; however, the doors were louvered (great for airflow) so some sound from the shared space carried into the bedrooms. Those of us who slept in could hear breakfast being prepared but since most of the time everyone was out on the screened in porch this was not a problem. In addition to a sliding door to the porch from the living room each bedroom also had a porch door. The house was clean, comfortable and fully stocked with everything you would need to prepare meals and we had breakfast at the house everyday and at most one other meal out each day. Had a great time it was everything we were looking for. The house was comfortable snorkeling was great . We loved the Island so much we are going back and renting again in September. Judy and family were great taking care of us . One suggestion would be it would have been great if we had a couple of kayaks to take advantage of the beautiful water. We knew it was going to be good...from the reviews we read....then we arrived and WOW! Everything we wanted was there and location...location...location! Thrilled with the pool and the snorkeling did not disappoint! We are really missing the amazing views! 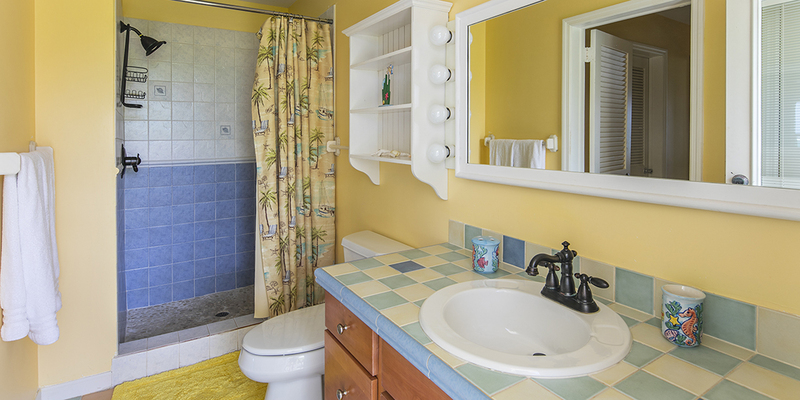 There is even an iron/ironing board and a small vanity mirror in the bathroom! ( it is the little things!) Kitchen was well stock! The kids had one side of the house and our bedroom was on the other side. Everyone was comfortable! We rented this house through Grand Cayman Villas & Condos and they had an awesome app filled with info and tips and no need to pick a key- they sent us the code and we got right in upon our arrival!! Fabulous trip and fabulous house! If you are looking for a secluded spot where you can relax and enjoy the waves, this is the place! 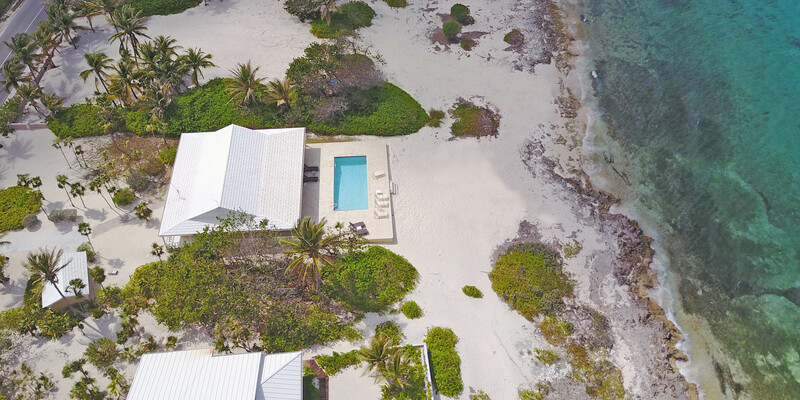 The home is right on a sandy beach where you can snorkel in the calmer waters. 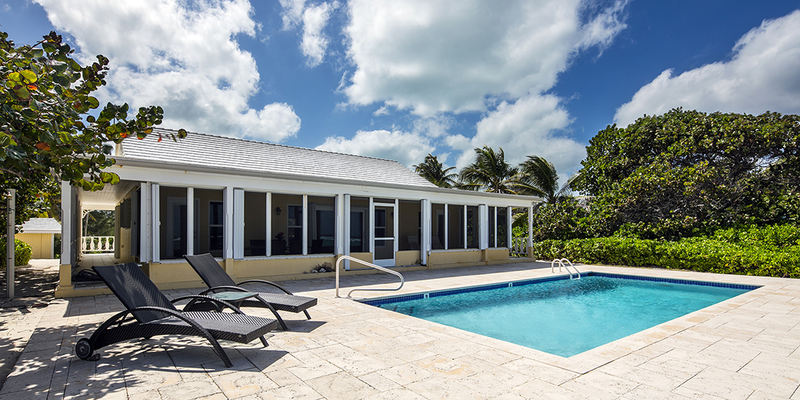 The private pool is a wonderful addition - not too many rentals offer this amenitie. The home is equipped with everything you might want; mixer, blender, baking dish, margarita glass, etc! The only downside I found was the intermittent internet service, and this may be for the entire island, and not just this location. Unbelieveably beautiful spot, great snorkeling! The house was ideal. 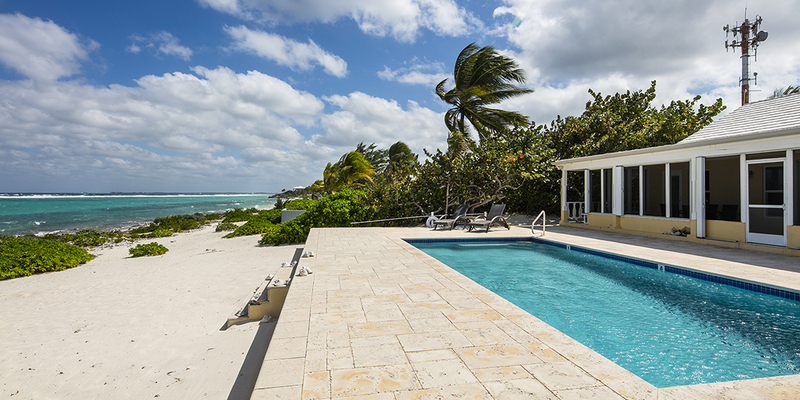 Landscaping makes it feel like you're the only one on the island when sitting on the pool deck. Fabulous view. Snorkeling is great without having to drive or boat to a reef. We had plans to make several day trips, but decided we had the best spot on the island right in front of us. House is laid out great with a big, open family room/kitchen. This rental is true to the photos. Rum Point is much quieter and more beautiful than Seven Mile Beach. The home was right on the beach with other houses around but still felt very private. We loved snorkeling right out in front of the house. We saw sea turtles, rainbow fish, sting rays, barracudas, eels, and many colorful fish. Having a private pool was awesome! The breezes made it so we never had a problem with bugs day or night. Check in was easy. The home has comfortable beds. We cooked a lot and the kitchen had everything we needed. Dishwasher and laundry room were great. The shower had good water pressure and the air conditioning worked fine. The caretaker stopped by to check on us the first day. The price for off season could be lower. The only downside I found has nothing to do with the house but the airport. It's too small for all the flights taking off on Saturdays. We felt like sardines. The bathrooms were outside and lines were long. One airline made an announcement to use the bathrooms before getting on the plane because the restroom facilities were not working on the plane! So if you could get a flight departing any other day besides Saturday, I think it would be more pleasant for you. Thatch Hill was the perfect size for my family of five. The location is very private and right on the beach with a screened porch and pool overlooking the caribbean. We couldn't see any of the neighboring houses from the pool area because of the vegetation - at times we felt like no one else was even in the area. However, you can walk or drive to Rum Point for a little action if you need it. There is really good snorkeling right behind the house and in either direction up or down the beach(bring your reef shoes and be careful.) 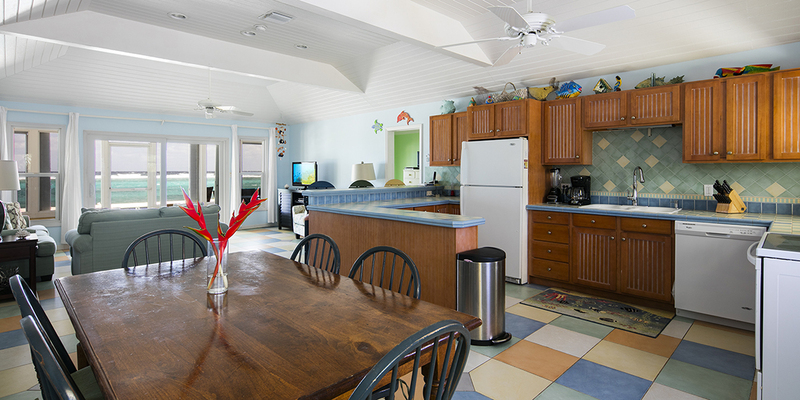 The kitchen is well stocked and the furnishings are suitable for a family vacation on the beach. We would certainly stay at Thatch Hill again if we ever get back to Grand Cayman. There are certainly bigger and probably newer homes around but none are in a better location than Thatch Hill. For the price, Thatch Hill was a really good value. We didn't meet a person our entire stay, local or otherwise, who was anyting other than friendly and courteous. We drove to the east end of the island and ate at Tukka on two different nights and really enjoyed it. We stayed at Thatch Hill May 18th-25th 2013. It was amazing. The house is very quaint and has everything you need in it. Lots of cooking and dining dishes and glasses (plastic and glass). Very clean. 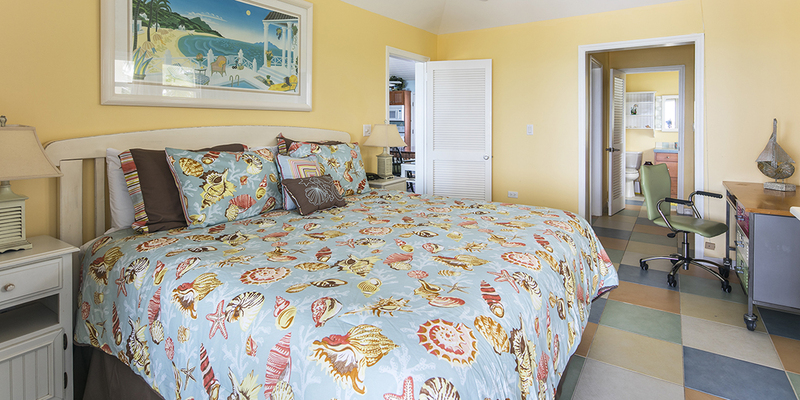 The master bedroom has a king size soft bed and large walk in closet and beautiful bathroom with a large shower. There is a wrap around deck that you can exit out to by bedrooms and bathrooms. The other bed room has 2 twin beds that were reported to be ok to sleep on as well as the bunk beds. The other bed room also has a large walk in closet and it has a tub shower and 2 person sink. The view from the living room patio doors is amazing of the pool and ocean. The pool is a great size and goes from 3 feet-6feet. There is a screened in porch which is great to get away from the sun when needed and nice to have dinners at. There is a table and chairs and other lounging chairs there. Bugs were not bad but had a few mosquitoes the first evening/night. The beach is really nice. Now, there is a stretch of seaweed with debris in it closer to the water and you only see it when you come up to it but I can see if it bothered some people but it was pretty much like that the whole beach except for where they raked their beach front. It is the storm line and it is debris (garbage) that comes in with the storm tide. We didn't let it bother us and frankly if there was a rake my husband would of cleaned it up asap and it would of been done. But don't let that spoil your trip. The water is amazing but you do need water shoes or rent a pair of flippers at Rum Point for 5.00 a day for snorkelling. They also have life vests you can rent. There is great snorkelling in front of the house. We saw a small octopus, and sting rays and parrot fish and all kinds of coloured fish big and small. The flora is beautiful and lots of conch shells and sea fans! The water was so warm and if you are afraid of the water and not being able to touch bottom it is best to snorkel at low tide or rent a vest. There is grass then sand but the sea life is in the sandy area with the coral. The reef has a lot more fish so my husband said but I wouldn't go out that far. There is a reef that surrounds the island. You can always hear the waves crashing out there and it sounds beautiful. The water in front of the house is fairly calm and protected by the reef. There was always a breeze at the house. We went to Rum Point about a 5 minute walk and the gift shop is great, drinks and food is expensive and there is no breeze making it a bit too much (hot) for us. We preferred our house. The Rum Point restaurant was good and once again the sound of the ocean makes it wonderful. There is the Kaibo restaurant near by that is less formal down stairs and has a great menu and beach parties on Tuesday nights with dancing in the sand. The restaurant "Over the Edge" is 5-10 minutes down the road and is amazing as well as the Light House Restaurant which is about 20 minutes away (expensive but so worth it!). You will need a car and driving can be a bit of a challenge on the other side of the road but you will get the hang of it. I would pick this house any day. Everything worked well. The only thing I could growl about is that the a/C didn't run at night and the people sleeping in the bunks had no fans so they found it too hot. We could of called to see what we could do about it but it wasn't that big of a deal for us. There was satellite TV and it had lots of stations. Go and relax. If you want a bit of adventure go to the Red Sail company at Rum point and go on an excursion. We did the sting ray tour and loved it. They have other tours that I heard were good too. I would go back again in a heart beat! From looking at the other rentals, I am more then happy with Thatch Hill. I love having a pool and ocean. Lots of others do not have pools. If I could I would buy it (thats how much we loved it!) Have fun if you go and stop and listen to the waves and appreciate the peace and tranquility of the island!!! Thatch Hill has a great location! On the water..close to Rum Point, away from the commercial areas...perfect for a beach getaway. The house is good but not special. It is well managed and was easy to rent...and reasonably priced. You'll need a car (use McCurdy's!). Had some problems with tv, but you don't go there for the tv. We've rented in Cayman a few times and this was the best value. We'll rent it again. It easily accommodates up to 2 couples, not more. Our stay at Thatch Hill was fantastic. It is a great house for a family of four or two couples. The house was immaculate and well equipped. The pool was gorgeous and the view to die for. We loved how close it was to Rum Point. It was great that all our water sports needs were just minutes away. All in all, a great week! Very private and peaceful villa. Close to Rum Point. Decent snorkelling right off the back yard. Quite windy around the pool. Ideal for a family of 4-6. A great location for chilling out and enjoying the reef snorkelling right outside the villa door. A comfortable home for 2 couples with a pool and plenty of lounging space.